Students from Msgr. 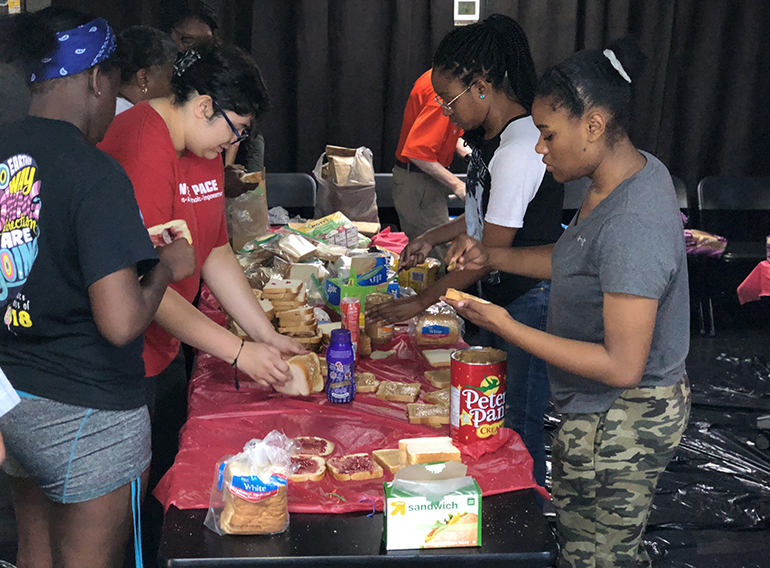 Edward Pace High and Chaminade Madonna College Prep prepare sandwiches during Hunger Fest 2018. The retreat, which was brought over as a tradition from Archbishop Curley-Notre Dame High, celebrated its 22nd year at its new home in Pace. MIAMI GARDENS | In April, Archbishop Curley-Notre Dame’s annual Hunger Fest celebrated its 22nd year at its new home in Msgr. Edward Pace High. A combination of 40 veteran and rookie students participated, as well as students from Hollywood’s Chaminade Madonna College Prep who aim to bring the tradition to their school. Started by the Edmund Rice Christian Brothers at Curley-Notre Dame, the retreat raises consciousness about poverty and world hunger through prayer, almsgiving, and fasting from food and beverages, except water, for 27 hours. Hunger Fest typically takes place during Lent. At Hunger Fest, students raised funds for sister schools in Haiti by hosting a car wash. They also prepared bagged lunches for the homeless at the Miami Rescue Mission, the Missionaries of Charity shelter, and the Broward Outreach Center. Keanu Orfano, a 2018 Pace graduate and first-time participant, described the event as a humbling experience. “I felt glad knowing that each meal I put together and counted was going to someone who really needs it. I felt that the Holy Spirit was passing on from us, to the bagged meal, and to the person receiving the meal,” said Keanu. “Our goal was to make around 1000 bagged lunches but we exceeded that by more than twice that many,” said Dimitri Francois, a former Curley-Notre Dame student now at Pace. What kept them from bagging even more? They ran out of bread. Ultimately, they delivered 2,342 bagged lunches and raised over $1,000 dollars for Pace’s sister schools.